With Kyrie Irving and Marcus Smart down, the Celtics looked left for dead prior to the playoffs. But that left room for the emergence of “Scary Terry”. Perhaps no one in the world has been invested in Terry Rozier’s success as much as I have. Nearly three years ago, at the 2015 NBA Rookie Photoshoot, Rozier more or less ended my athletic career when he essentially performed a series of NBA Street moves on me before draining a three in my face. (Unfortunately, there is visual evidence.) You could argue that moment was actually the highlight of Rozier’s rookie season, as he only appeared in 39 games for Boston in 2015–16. Fast forward to the 2018 playoffs, Rozier has become a key cog in the Celtics machine, and I’m telling everyone I was humiliated by a future All-Star. Rozier’s emergence quite truly could not have come at a better time for Boston. You probably read that cliché a lot, but the Celtics looked left for dead heading into the playoffs with both Kyrie Irving and Marcus Smart injured. It looked like some teams in the East were even jockeying backwards for playoff position so they could see Boston in the first round. Thanks in large part to Rozier, seeing the Celtics in Round 1 proved futile for the Bucks, who saw their pricey midseason acquisition Eric Bledsoe be thoroughly outplayed by the young Rozier. 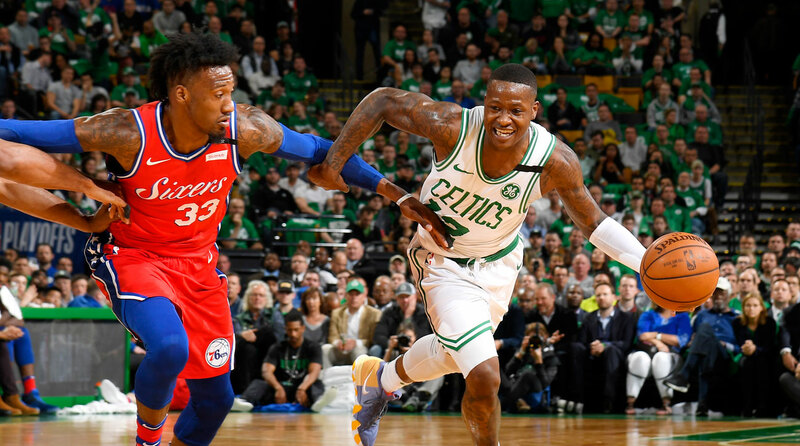 In Game 1 against the 76ers, Rozier went off, scoring 29 points, including a blistering 7-of-9 from three. Somehow, Boston is again leading a series it probably has no business being a threat in. Rozier’s offensive game is fearless. He shot 38.1% from three during the regular season, and he’s increased both his volume and efficiency in the playoffs. The sample size is certainly small, but Rozier has certainly flashed his potential through the first eight games of the postseason. His threes come in a variety of actions. Rozier isn’t afraid to pull-up on the fastbreak. He’ll shoot if you give him space and go under pick-and-rolls. And he’s also effective as a kick-out option for Boston’s lankier forwards. Rozier has also shown an ability to get into the paint, and while he’s not quite the finisher Irving is, he does have some nice touch around the rim. Boston’s defense hasn’t been great with Rozier on the court during the playoffs, but his offense has offset any issues on that end. What’s promising is during the regular season, the Celtics had a 104.2 defensive rating while Rozier played, so it’s possible to have a stingy defense around him. Rozier is far from a mess on that defense, and his long arms are a nuisance for most non-Ben Simmons point guards. The emergence of Rozier is important on so many levels for the Celtics. At the baseline, he’s helping keep the team competitive in the wake of the Irving injury. (Let’s not forget Gordon Hayward either!) Boston’s offense was average at best before the playoffs. But the Celtics’ offensive rating has jumped from 105.2 to 107.7 in the postseason. That second mark would have been good for a top-ten offense this year. Boston hasn’t just morphed into an offensive juggernaut overnight. But Rozier—who is averaging more minutes and points per game in the playoffs than he did in any month during the regular season—is one of the guys elevating his game to help the Celtics go toe-to-toe against teams with arguably better top-end talent. For the long-term, Rozier has become an interesting piece. He’s proven this season he can be a capable backup (at the very least) for Irving. Moving forward, he can provide scoring punch off the bench, and he’s big enough to play in two-guard lineups with Kyrie. (Irving and Rozier played 534 minutes together this year with a 1.8 net rating.) With Marcus Smart headed for restricted free agency, Danny Ainge could be more willing to let Smart walk if he’s confident in Rozier playing significant minutes in the future. Rozier will be eligible for an extension this summer, otherwise he too will become an RFA in 2019. Of course, with the wheeling and dealing Boston likes to do, Rozier has also improved his trade value with this playoff run. Could Boston dangle Rozier in a trade for another superstar? I’m sure Ainge would do it. Other teams should probably be a little careful. Trading for someone after one hot (and short) playoff run isn’t always prudent, and I would personally be a little worried about taking someone out of Brad Stevens’s cocoon and expecting the same level of success. Ainge, though, holds all the cards. For now, Celtics fans should enjoy Rozier and the run him and this team are putting together. Boston is pretty much the liquid-metal Terminator at this point. No matter what you do to the Celtics, they put themselves back together and keep coming after you. Rozier has been a huge part of that never-quit relentlessness during the playoffs. I couldn’t be happier for him. Or myself.